Ever paid over $6 for a tiny box of cereal, and then witnessed that the contents in the tiny box only fed three people one small serving? As delicious and convenient as the box of Dark Chocolate Almond Granola was from Cascadian Farm – that is one pricey breakfast. The result of my experimenting turned out delicious! I did a little rough math to determine how much money I saved. These aren’t the cheapest of ingredients, but they are hearty and can stick to the ribs. 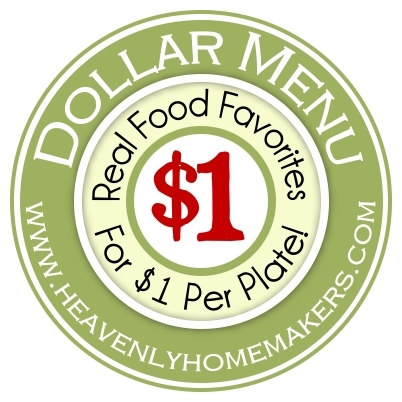 I found that I cut the cost from over $2 per serving to around 75¢ per serving – even using mostly organic ingredients. In a small saucepan, melt coconut oil and honey together. Stir oats, shredded coconut, and slivered almonds together in a large bowl. Drizzle on the honey/coconut oil mixture and stir well. Pour mixture onto a large, parchment paper-lined baking sheet (or two 9x13 inch dishes). Bake at 300° for 35-45 minutes, stirring after the first 20 minutes. Stir in dark chocolate chunks. Store granola in an air-tight container. You may have noticed that this recipe is in the Healthy Breakfast Made Simple eBook. Haven’t downloaded that yet? Get it here for free! Just a couple of days left in our Getting Ahead for Breakfast Challenge. How’s it going for you? Have you made some breakfast foods ahead to save you the effort in the morning? This sounds wonderful! I will have to try it. Bless you!!!! I have become quite enamored with a box of dark chocolate granola at my local grocery store that thankfully is not $6 a box, but is still pricey for a box that turns out to be only half full when you open it the first time. One question… can you substitute the almonds for another kind of nut, and if so, which ones? My daughter is still nursing and appears to have a sensitivity to almonds. I definitely think any other kind of nut could be subbed – whichever one you like best! I bet pecans would be delicious! I pinned and can’t wait to make this. Thanks so much! Bookmarked to try later. Looks yummy! I bought two things of oats last night to make ahead your instant oatmeal (for when Grandma comes to watch the kids while my husband and I attend a wedding) and I plan on making some granola too. Thanks for showing how easy and inexpensive this can be. With 5 kids I can’t imagine how expensive food will be when they are all bigger. Wow, what an awesome breakfast recipe and such perfect timing! Just this morning I opened one of the Nature’s Path’s cereal and looked at this bag 1/2 full (luckily it was on sale and not near $6) but that bag was certainly not going to satisify my family very much. I am in your challenge and I am so thankful!! I have muffins on the counter, in the fridge and in the freezer. I have apple sauce, oatmeal and I am about to make this granola!! You are in inspiration and I did not think I could get ahead, but oh what a journey:) Thank you, Thank you, Thank you!! My husband was a little spectacle at first, saying we could just buy the box stuff, but his tummy is saying differently now, he loves everything I am making, as well as my kids:) Looking forward to new challenges, so keep them coming!! I’ve never tried that in a recipe like this, but I do think it would work. I’m not sure how much to be subbed though! We have been away from home quite a bit these last two weeks, but when I had Friday at home I spent the day cleaning house and working on getting ahead! I made a batch of Basic Muffin Mix and Whole Wheat Quick Mix from Oh, For Real! and used some of the muffin mix to make some dark cherry lemon muffins. We had some meyer lemon marmalade that we didn’t like, so I heated it, strained it to take out the rind, and used what was left of the jam in place of orange juice concentrate in the Orange Cranberry Muffins. Then I used cherries instead of cranberries. So those are in the freezer because all I had to do was plop them in the pans, freeze, and bag them up! So now we have several easy breakfasts and treats in the fridge. Love it!! baking right now and it smells wonderful! I must say it seemed oilier than other granola recipes I’ve made, so I added some oats. But I notice that the ebook version (which I was following this morning) says 1 cup of oil and this one only says 3/4 cup, which I’m thinking must be just right. Shoot, I forget to change that in the ebook. Thanks for pointing that out. I’ll make that change. I just made this and had to have it it right away. SO very good. Two things to note, one, parchment paper is probably very crucial, as it stuck to my wax paper. I’ll buy parchment paper next time! Also, I don’t know if it would have turned out the same at 45 minutes, but I went one hour with the granola because it seemed too wet still at 45 minutes. However, after feeding the baby and letting it cool longer than I meant to, it was very sticky, and though golden brown, still a bit wet, or oily/greasy, like Amy S. mentioned. It did seem to crisp up quite a bit for the most part. Very good, and I would totally make this again! Thanks Laura, for the wonderful remake of an expensive boxed cereal! I keep a jar of a very similar recipe in my cupboard all the time. When I use 4 cups of oats though, I only use 1/2 cup of fat (mixture of butter and coconut oil) and 1/4 cup honey, 1/4 maple syrup. It still works great and is healthier and cheaper :) As for add ins – the list is endless! I always add ground flax seed and any nuts and seeds I have on hand as well. Homemade granola is my favorite! Just tried this recipe with the 1/4 cup honey and 1/4 cup maple syrup and 1/2 cup coconut oil. I also used pecans because I didn’t have any almonds on hand, and added some shelled pumpkin seeds. It was so good. I will make this again! starting to eat healthy again. I made your pumkin muffin and right now the cereal is in the oven right now. 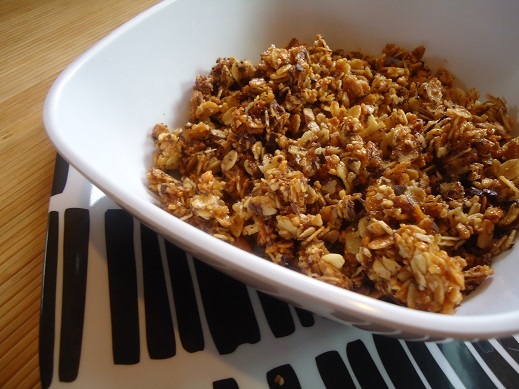 Great recipe – we LOVE homemade granola around here. One thing I found that is so easy – got idea from ‘crystals lazy granola’ – you can bake granola in the evening -10 min at 375, turn off oven, leave pan in there and in the morning you have perfectly crunchy granola —-and a house that smells good enough to get the sleepiest of teenage boyz up!!! Thank you for this tip! I used it last night. Nice recipe. I’m a huge fan of dark chocolate & granola. It can be so expensive to buy from the store though. It sounds pretty easy to make, and it will definitely be a lot cheaper than buying it. Perfect, easy recipe for a healthy, tasty breakfast. I slightly tweaked your recipe to follow my vegan diet (used agave nectar instead of honey) and the ingredients available (semi-sweet chocolate instead of dark). I will keep this recipe handy, as we will be making this often! I would sub in any kind of nut or dried fruit you like. You can also sub butter for the coconut oil. This might be a stupid question but do you eat this as cereal with milk or plain? Not a stupid question! ;) You could eat it both ways and it will be delicious. My 3 year old and I like it mixed into plain yogurt. Could you substitute butter for coconut oil? Yes, that will work great! I have this in the oven right now! I found it just a bit oily as well, and probably added an extra cup of oats and 1/2 cup pepitas. I usually leave my granola in the oven for several hours after it’s done baking to let it crisp up a bit and then always store it in the freezer-I love it cold with a cold glass of milk-YUM! Can’t wait to eat this new recipe! How long will this last stored in the air-tight container? Do you store it in the fridge or in the pantry? This should last for weeks. You can store in the fridge if you want, but it is not necessary. There’s no way this stuff lasts for weeks, especially at my house…so good!!! I’m wondering if anyone knows how I might add millet and/or quinoa to this to sort of replicate a brand I buy. The one I buy has dried cranberries added, too. Does the millet or quinoa need to be cooked and then dried, puffed/popped, or does it just “cook” during the baking process? Am so going to make this as soon as I replenish my oats supply. Thanks for the easy recipe, Laura! Made this on Saturday–so yummy! I have not tried adding quinoa or millet, but I did add pumpkin, chia and ground flax seeds. Per LeeAnn’s comment, I used 1/4 c each honey and maple syrup and cut oil to 1/2 c. That batch is almost gone; plan to make another today. This is definitely a keeper recipe! I add 2 tbs uncooked quinoa and it works great. If you add dried fruit, mix it in after you bake it or it gets very hard to chew! So long as I leave raisins out, my kids LOVE granola. We used to eat it by the handful as kids, sneaking it from the pantry ;0) I think this one would warrant a tipping up of the jar and straight into the mouth :D Delish! Hi Laura, I just printed the page from the ebook for breakfast ideas. I enjoy trying new granola recipes. The 1 cup coconut oil is listed in your ebook instead of the 3/4 cup coconut oil from the recipe given in your blog. Thought you would like to know. I just have to say we love this granola I did reduce the honey a bit and added a heaping tablespoon of dark cacao powder oh how we love it. Thank you for the recipe! 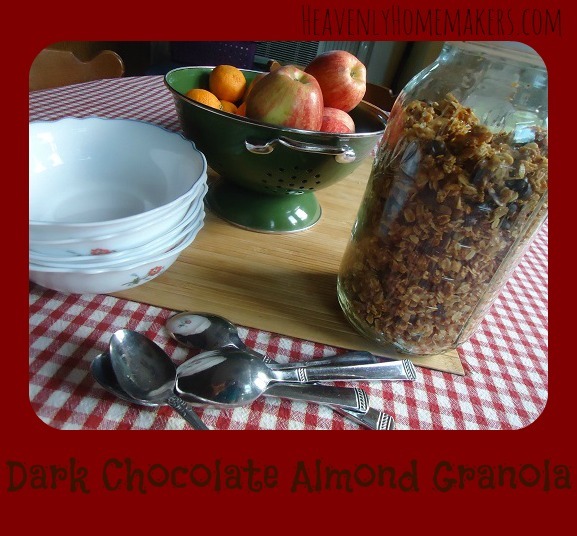 Looks delicious though I am curious if you have ever made granola without any coconut? I am allergic to coconut and since you use both coconut oil and coconut I’m just curious how I could change the recipe. Ohh thank-you. Can’t wait to try it!